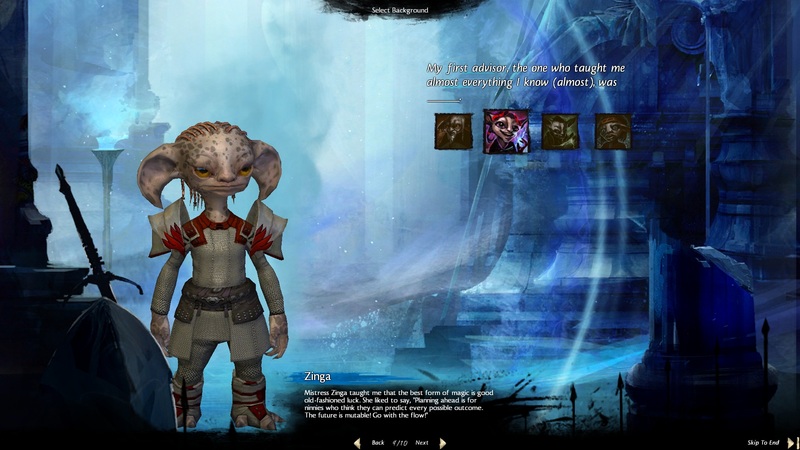 Having pre-purchased Guild Wars 2 some time in the last months (and having playing during the second beta weekend) I was eager to dive headfirst into the new content that the third beta weekend provided, namely the asura 1 and the sylvari 2. 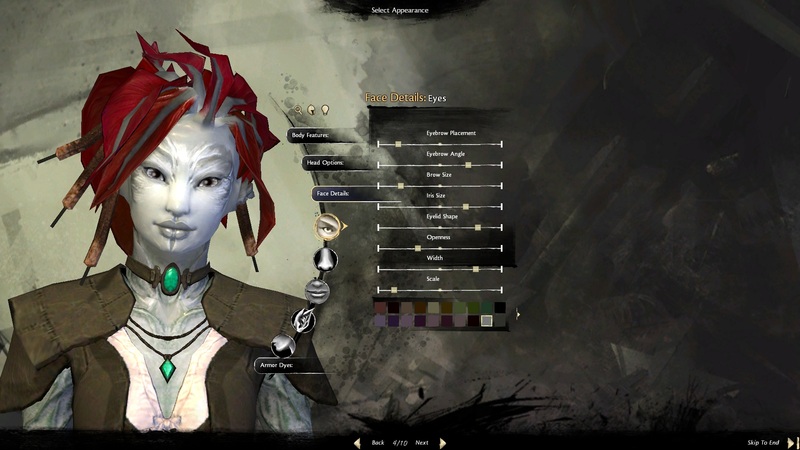 As I have been waiting to play the sylvari for a long time - read: since they’ve been announced - I spent more than two hours for character creation, all the while documenting everything for Anja, who wanted to see the new race but hadn’t purchased the game. My biggest surprise was the fact that sylvari glow in the dark. You may choose a color in which parts of their body slowly pulse during night, which I found to be quite interesting, although I wasn’t entirely sure which color to pick, since I liked non of them enough. I mean, I made my female sylvari thief 4 gray this time. Maybe I’ll stick to a faint green another time, but I’m rambling. I played for some hours, doing various quests and had a lot of fun - which is important since playing a game should not feel like you’re doing work. I admired the beauty of the sylvari’s houses and although I forgot to check out their capital, the Grove, I found their relation to nature and the artful surroundings amazing. 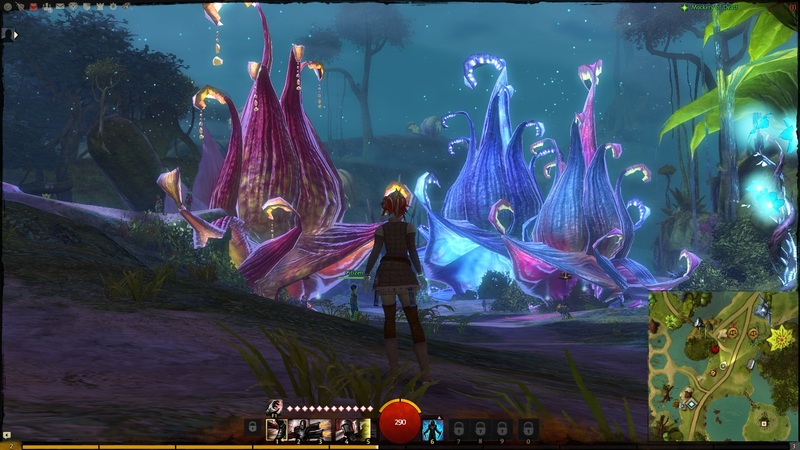 If you want to convince people how beautiful Guild Wars 2 can look, show them sylvari blossom houses. Or show them the stunning hive of busy asura that is Rata Sum, their capital. Which leads me to the second part of my experience this weekend: I also tested the asura, this time a male asuran guardian 3 and during that time I played together with Ron to get an impression of the different personal stories, since we picked different answers to the personality questions asked during character creation. It was nice seeing that seemingly little questions decide which kind of personal story you get to experience when playing. It also gave me a chance to test something different than the thief class, although I’ve pretty much already decided that the character I’ll be playing with the most will be a female sylvari thief. My asuran guardian however was a whole different story in terms of gameplay. After some questing with Ron, we decided to see other things however and ended up in Rata Sum. 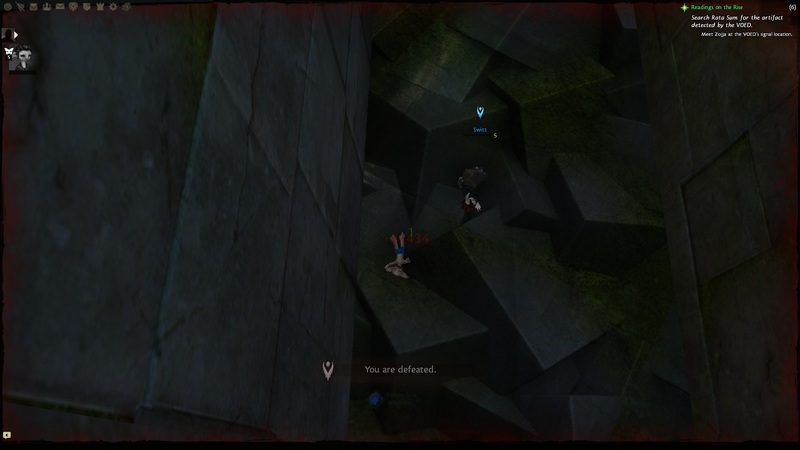 During a lot of exploring there we also discovered that you can fall down rather far inside the city and had a little contest who can rack up the most damage from falling. My top damage was around 41.400 but unfortunately Ron bested me by achieving 43k. I blame that on my increased vitality as a guardian and him being a squishy mesmer 5. 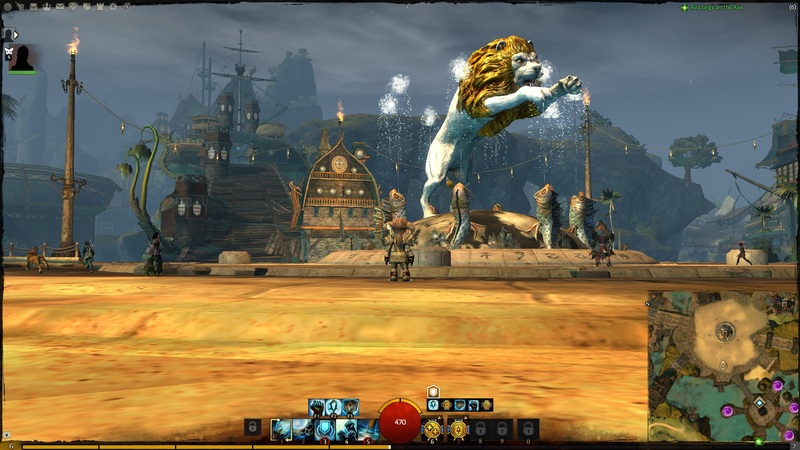 I also headed to Lion’s Arch for a while where I was amazed by the ship and pirate based architecture and the giant fountain which has a great history of collaboration amongst the different races of Tyria (speak to the lady in blue next to the fountain for its story). All in all I really enjoyed playing the last beta weekend before Guild Wars 2 is released in August and am looking forward to playing the full version for more than a day or two when it’s complete. As a little addendum I’d like to thank the developers for the awesome feature that the “deposit all collectibles” button in the inventory is. It instantly sends all raw materials for crafting as well as obtained minipets to the bank in order to gain new space in your inventory after some looting while exploring the gorgeous world the dedicated people at Arenanet built. 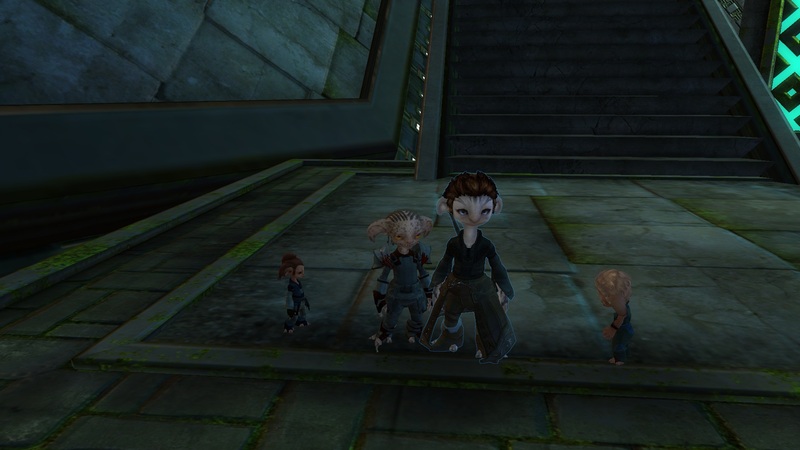 I’ll end this post with a heartwarming group shot containing my and Ron’s character and two cute little asuran kids on the port of Rata Sum.